varnoir7 wrote: Does anyone know of a proxy that will deal with larger items? I am looking to get something from Muji that is Japan only (already tried Jake and Stylistics but to no avail). Also interested to know. Looking at buying some furniture (not muji) & JP retail is way cheaper. oh and comms and process with Buyee is smooth and easy unlike a lot of big proxies that send tons of pointless emails to confirm every minute step.. Anyone know of a Korean proxy / anyone in korea on here? Other than Honette obviously. Cheers Mil. Just to go back on the Buyee discussion, been using it a lot lately and it's currently my favourite place to buy bits, with pieces from Supreme, Sasquatchfabrix, Soloist, Comme, Yohji and tonnes of vintage bits in abundance, and I generally end up paying less then half of the retail price, sometimes getting tee's for £10 or £15 quid which is amazing. My question to anyone who's used it regularly, is if it's possible to get them to mark down the packages so I pay less custom fee's, and if so how? That's the only part I find draining, as the fee's are generally quite high..
Nobuyoshi wrote: Cheers Mil. Just to go back on the Buyee discussion, been using it a lot lately and it's currently my favourite place to buy bits, with pieces from Supreme, Sasquatchfabrix, Soloist, Comme, Yohji and tonnes of vintage bits in abundance, and I generally end up paying less then half of the retail price, sometimes getting tee's for £10 or £15 quid which is amazing. Use Fromjapan.co.jp, 200 yen per item commission fee, has a points system (1 point = 1 yen) which can be redeemed against other purchases. You can also set the value they declare on the custom forms. Anyone who does in store pickups from Tokyo or Fukuoka? Rirawin wrote: Use Fromjapan.co.jp, 200 yen per item commission fee, has a points system (1 point = 1 yen) which can be redeemed against other purchases. You can also set the value they declare on the custom forms. Man I thought Buyee was cheap. Yeah Nobu, there's def no way to mark down on Buyee. I don't mind coz in Australia the customs limit is $1000 and when it goes over they usually don't bother to charge duty anyway. I'm generally getting hit with about 15 - 30£ per item I've received so far on Buyee, which obviously isn't a great deal but I'd much rather shave it off entirely. Gonna try fromjapan, thanks lads. Them UK customs boys are on their game..
Not Japan, but Haven boys are pretty decent at marking down aren't they? Ordered, then asked (novice mistake?) but they havent got back to me yet? No one found a proxy that deals with Mercari yet? Crackajack wrote: Anyone who does in store pickups from Tokyo or Fukuoka? Doesn't jake to store pickups? Fuzzyduck121 wrote: Doesn't jake to store pickups? pyscho wrote: Not Japan, but Haven boys are pretty decent at marking down aren't they? Yes, always mark down without having to ask them. Anyone have a contact for eepee? 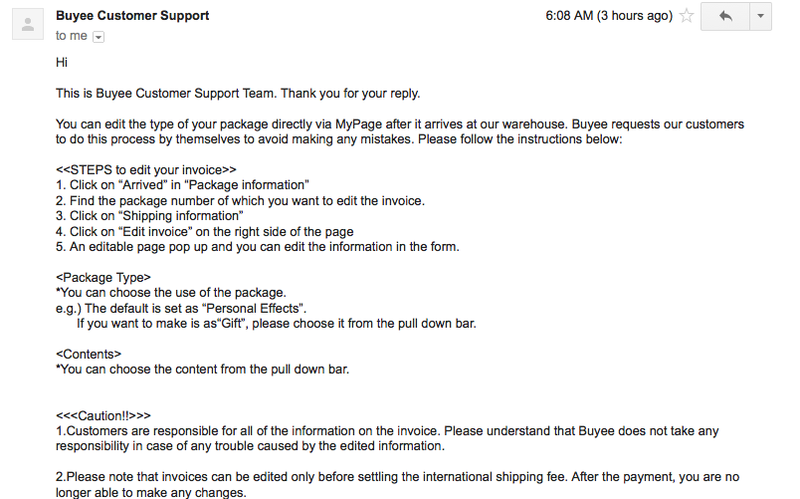 Just an update on my last question, Buyee replied to my email and it turns down you can edit the invoice yourself on their website, as far as I'm aware marking the package as a gift means you wont have to pay any customs fee at all? Good news if so, more info below if anyone wants to try. No you still need to mark down to avoid fees importing into the UK. VAT is payable in all cases. the duty amount payable is less than £9 (€10, or equivalent in local currency). it is to your benefit. Otherwise the normal duty rate applies.